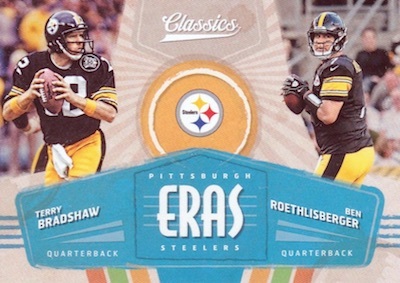 Evoking a bygone era of NFL collecting, 2018 Panini Classics Football goes retro for top current and former players, plus key incoming rookies. In addition to multiple inserts and parallels, each Hobby box contains one autograph and one memorabilia card. 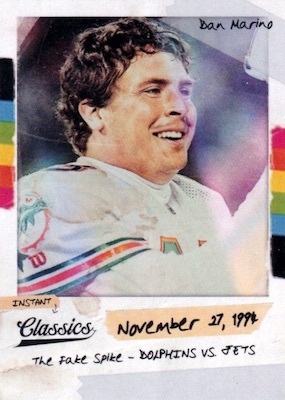 Starting with the base set, the 2018 Panini Classics Football checklist consists of 300 cards which are split into 100-card subsets for veterans, legends and rookies. Card backs really get into the old-school fun with custom designs and player trivia. Just as the product did in 2017, multiple parallels change the colors and even add or remove information. This includes Red Back (#/299), Blank Back (#/50), No Name (#/10) and Full Name (#/5). 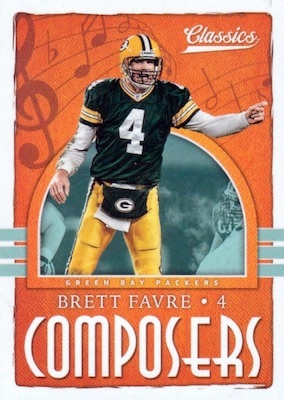 There are also Timeless Tributes parallels in Gold (#/99), Orange (#/25), Blue (#/10) and Black (1/1). The chromium Premium Edition parallel is new to the set, utilizing OptiChrome technology to spice up the base design. These average four per Hobby box with one being a parallel numbered to 175 or less. 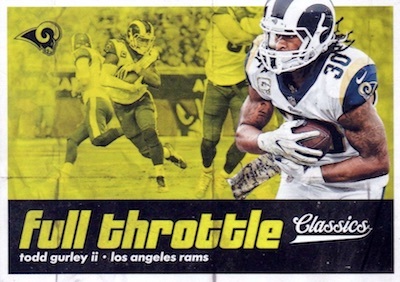 2018 Panini Classics Football also has inserts that combine to fall one per pack. 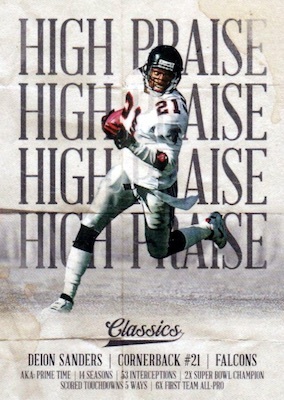 High Praise is among the choices with a focus on NFL legends. Meanwhile, sticker cards drop 1:12 packs, and include Award Winners, Team Pennants and Vintage Logo Stickers. With one signed card and one relic per box, 2018 Panini Classics Football offers several premium inserts, as well. 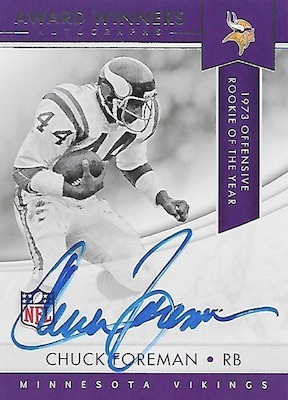 The Significant Signatures line extends across the base checklist to cover many veterans, legends and rookies. 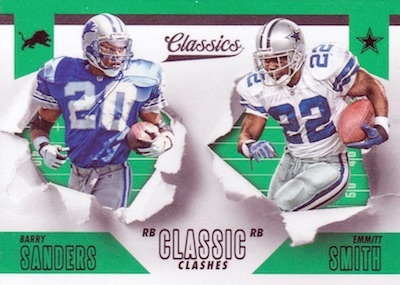 There are also the Prizm-based Classic Combos Signature cards with a pair of autographs on each. 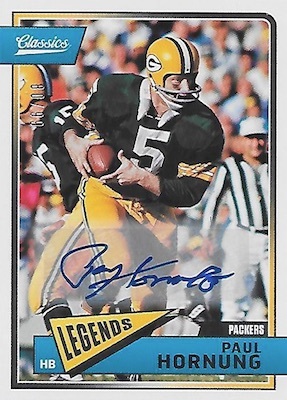 On-card Buyback Autographs are rare but should average one per inner case (10 boxes) or two per 20-box case. These take cards from earlier sets dating from 1988 to 2017. 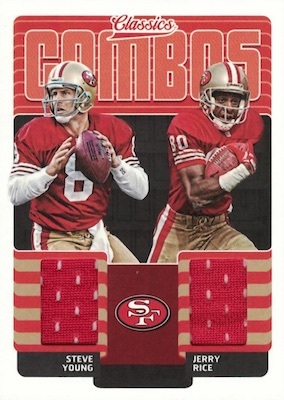 Regarding the memorabilia, 2018 Panini Classics Football celebrates Hall of Fame players with Canton Collection Swatches. Collectors can also find relic cards in Classic Materials and Classic Combos Materials. 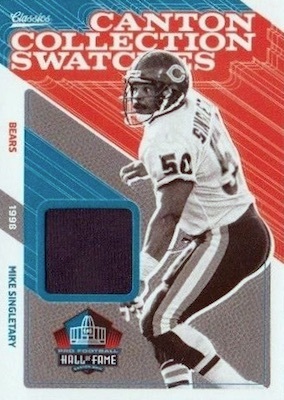 Extra rarity exists through the Prime parallels, numbered to 50 or less. PARALLEL CARDS: Red Back #/299, Blue Back #/175, Blank Back #/50, Green Back #/40, No Name #/10, Full Name #/5. TIMELESS TRIBUTES PARALLELS: Gold #/99, Orange #/25, Blue #/10, Black 1/1. PARALLEL CARDS: Red Back #/175, Blank Back #/35, No Name #/5, Full Name 1/1. 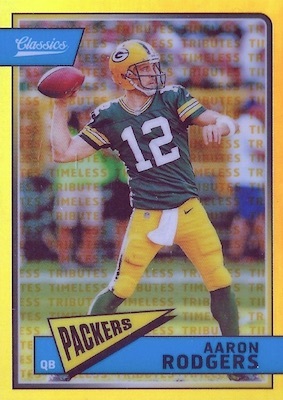 TIMELESS TRIBUTES PARALLELS: Gold #/65, Orange #/15, Blue #/5, Black 1/1. 149 cards. Shop autographs on eBay. PARALLEL CARDS: Gold #/49 or less (No Garoppolo, Pettaway*), Orange #/25 or less (No Garoppolo, Baldwin*), Blue #/10 or less, Black 1/1. 43 cards. Shop autographs on eBay. PARALLEL CARDS: Gold #/25 or less (No Wentz, Manning*), Orange #/10 or #/5 (No Butkus*), Blue #/5 or #/3, Black 1/1. PARALLEL CARDS: Gold #/20 or less (No Woodson, Reed*), Orange #/10 or less (No Woodson, Reed*), Blue #/5 or less, Black 1/1. PARALLEL CARDS: Gold #/99, Blue #/10, Black 1/1. See the 2018 Panini Classics Football checklist spreadsheet. Let’s remember one thing everyone. Not everyone can afford $100 and up for boxes with 5 or 6 packs in it. This is a very affordable product for a lot of collector’s at it’s price point. Especially collector’s that want a chance to complete a set. In addition, at it’s lower price point 1 autograph and 1 memorabilia card really isn’t bad at all it’s quite good. I really liked last years Classics design. This years looks like the cheap box sets that Toys r Us or Revco Drugs used to put put for $1.99. 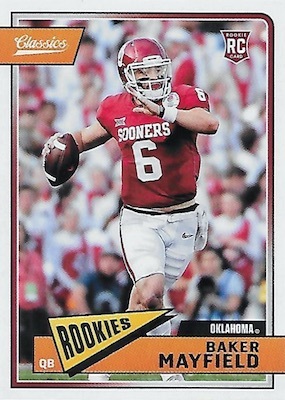 So great to know that Panini has a monopoly on the football card market again, with their ZERO innovation abilities! Are there going to be blaster boxes of this product this year? Wish it were better. Looks like there are too many duplicate short prints. Can you tell me ifnthere is any kickers on this set, do you know a setmwith kickers for 2018 ? Nice to see they’re released, but where can I buy them? Any blaster boxes or other retail setups? There are 24-pack retail boxes and 8-pack blasters. Great, affordable product. Lots of numbered hits, Chrome, Chrome Refractors, extensive base set. 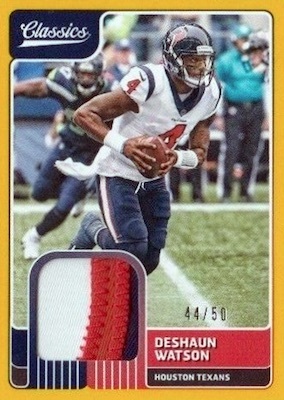 Nice job by Panini. and 1 Memorabilia card per box. 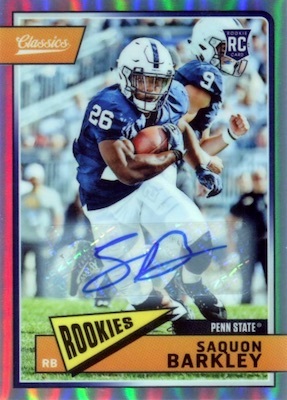 Think there’s an error on the checklist – I haven’t seen any Green Back /40 base cards yet, across multiple cases. Love Classics – it’s a relatively cheap break, with enough variety to be interesting, but without a million useless parallels / inserts. Plus a good blend of vets/current/rookies. Green Back parallels are in the 24-pack retail boxes. HUGE improvement over last year !! bought 2 boxes and didn’t do that well, but i love the design. higher quality cards plus the Opti – Chrome are sweeet il’ll make a good parallel chase. I’ll buy a few more boxes. Roger Wehrli, STL Cardinals, HOF’er, card #146, is misspelled on the front(Wehril is incorrect). 2018 Panini Classics Football Hobby Box - Factory Sealed!